Grado GR8 review | What Hi-Fi? Grado could easily ignore the in-ear market, safe in the knowledge that it manufactures some of the finest ‘on-ear' headphones that money can buy. But no: Grado is branching out into this sector with a pricey pair costing £300. The GR8s certainly don't look as snazzy as some near rivals, offering a more subtle and understated look. They come with four different sizes of ear bud, but annoyingly there's no carrying pouch – surely you'd want to protect such an expensive investment? But they perform well: they have an even tonal balance, and a very detailed, insightful presentation that peers into the music and digs up minute levels of sonic information. However, vocals don't sound quite as natural and believable as the best. They lack a certain harmonic richness, and as a result, they don't connect with the listener quite as fully. 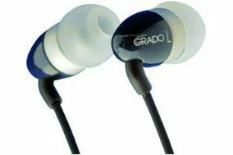 The GR8s are a fine addition to the Grado range but in this case, the level of performance doesn't quite justify the price tag.